Many people must have questioned the wisdom of Don Panoz, the multi-billionaire proprietor of luxury hotels, resorts and golf courses, when he ploughed a reputed ₤58 million into the creation of the five star St Andrews Bay Golf Resort to the south of “the auld grey toon” in the late 1990s. Were there not enough golf courses within and adjacent to St Andrews to satisfy the ever increasing number of visiting golfers who flock here every year to play at “the home of golf”? Panoz, who made his money in the pharmaceutical industry, finances high revenue pet projects like racing cars and tracks so he’s not in the business of throwing his money away on golf ventures that are going to fail – and so it has proved as St Andrews Bay has become a welcome addition to the golfing facilities in this part of the Kingdom of Fife. Designed by Denis Griffiths with the late golfing legend Gene Sarazen and evergreen Scottish senior Sam Torrance as the headline grabbers, the Torrance course is a 7,230-yard layout built on the clifftop overlooking the North Sea. 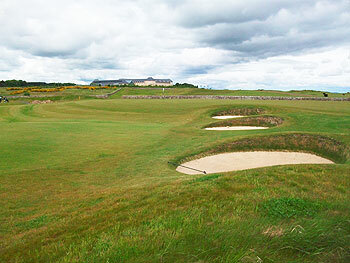 It was constructed with many principles of links golf in mind, offering risk/reward opportunities at many of the holes. The opening eight holes are routed up the hillside around the substantial site of the hotel and spa complex. This introduction offers the golfer a chance to acclimatise to the very fast running greens and take account of the many challenging bunkers that protect the putting surfaces. This is as near to links golf that you will get without the terrain being actually classified as such. Standing on the 8th tee, a downhill par three hole measuring 191 yards, the full glory of the remaining holes can be seen as the course opens out, displaying verdant green fairways flanked by wispy rough. The background is just as pleasing, with the Tay Estuary in the background and the county of Angus in the distance. There are some fine holes on the back nine, none more so than the 220-yard, par three 17th where the green is protected by a dry stone wall and deep, punishing bunkers. The course was reconfigured in 2008 when the old 17th and 18th holes on the Torrance were included in the layout of the new Kittocks course, replaced by holes 3 and 4 from the former Devlin course. Considerable effort was also made to isolate holes on the back nine by introducing large, shaggy mounds between fairways and these earthworks have resulted in an inward half that enjoys a wild, natural feel. The sister course at Fairmont St Andrews is the Kittocks, designed by Denis Griffiths with Bruce Devlin as the headlining architect. Day tickets were created for places like this where you will be hard pressed to find a more challenging 36 holes at one location. This is a really good test of golf with fairly penal rough. There are sea views from many holes, especially on the back nine, and at dusk the lights of St Andrews can be seen not far down the coast. Although the course has the look of a links course, when I played there the fairway grass did not seem to be the usual fescue and the ball did not run as you would expect. Holes 1 and 4 to 8 are around the hotel and conference centre with a burn in play, especially on the 1st and 5th holes. There are some tough holes early in the round, particularly the long par four 2nd and par five 6th. The 12th was formerly a tough par four but now is an equally difficult par five of 556 yards. Sixteen is at the furthest point from the clubhouse and has a most attractive outlook as you head directly towards the sea. Eighteeen is a long par five with a dog leg left for the third shot to a green that usually is subject to the ever present wind. The dog leg is now less severe than in the previous layout. I feel sorry for anyone who has paid £140 to play this very average course. We only paid £60 due to the time of day and in my opinion that was still too much for a course of this quality. The resort and facilities are excellent and staff extremely welcoming but if you are going to come to the resort then definitely play the Kittocks rather than the Torrance. If I were Sam then I would be ashamed to have my name on the course, it is just too ordinary with few memorable holes - I only played it two days ago and am struggling to remember many of the holes. Trying to be positive about it - it was in good condition, the greens ran true, the views are great and 17 and 18 are good finishing holes. We only paid £40 to play the Kittocks course and that is the best value golf that I have had in a long time. As with many of your other reviewers, this was terribly overpriced. I played well in good weather, so no bias there. Though it is challenging and greens were in good condition, there was little memorable about the course and it is far less enjoyable than the Kittocks, which has much better views and some spectacular holes. It is also not helped by the monstrous hotel towering over it. One to avoid unless you have limitless money and time. I played this course a couple of weeks ago and found it disappointing, as did my friends. It is not that it is a bad course although we all felt the back nine to be far superior to the front. Everything looks very impressive as you arrive; the staff are helpful and friendly. The course was in good condition for the time of year. BUT!! At a cost of £140 for a round you inevitably compare it to Kingsbarns. And that is the problem. I would pay the £175 for Kingsbarns in April. But the Torrance course in comparison is way overpriced. The condition is nowhere near the standard and the layout is not as good. So I am glad I played the course and I enjoyed the round. But unless they halve the green fee I will not be returning! On the same weekend we played Lundin and Gullane no. 2 and I rate both those above this course and for less than a third the cost. It is hard to add to the earlier reviews. There are several good holes here; I enjoyed the 1st and especially the last 4. In between there are a lot of decent holes, just nothing outstanding. Actually the highlight of my day were the wonderful views from the clubhouse. On a stunning September day with clear, crystalline light I was able to take some beautiful photographs looking over the course which are right up there with my all-time favourite golf pix! Two other points : I must agree with my good friend Jim McCann regarding the catering prices. Indeed I would say the entire Fairmont golfing experience is overpriced. That said, I much prefer the Torrance to the Devlin/Kittocks. I notice this is not the view of the current Fife rankings on the site! The Torrance course really does tick a lot of good golfing boxes and so it should for a venue that will host the Scottish Seniors Open for the third year in a row this August. Four sets of tees offer a challenge that varies between 5415 yards from the reds to 7230 yards from the blues so a wide range of handicaps are catered for. A number of fairways on the back nine have been sand slitted so some drainage issues are obviously being attended to. Greens – which are the real star of the show here – are as good as you would care to putt on and many are fronted by aprons that allow the traditional low running approach shot. The putting surfaces played firm and fast – a trait hated by the target golfer but admired by real links lovers. I thought the semi abstract mounding that was installed between fairways a few years ago had matured nicely, imbuing the course with a much more rugged feel than before. And the loss of the old 17th and 18th holes to the rebranded Kittocks has been well disguised by beefing up the home hole into a great closing par five with a wonderfully reconstructed greensite. So, all in all, the Torrance delivers as decent a links-like experience as you would care to find in these parts – and I’m sure the close proximity of its new competitor at the Castle next door will keep the Fairmont owners focused on what’s required to attract golfers to their facility. If only said proprietors would allow the clubhouse to be run as a place for ordinary golfers rather than treat it as an expensive grill house extension of their hotel up the hill. I played this lovely course on a beautiful morning in March. The hotel facilities could not have been better, and in the warm welcome from the starter I was made to feel quite special. I enjoyed the great challenge that has been laid down by Sam Torrance. He really is a credit to Scottish Golf! He has considiered of every level of player here, and offers interest and challenge from each of the tees. The greens were in fine condition and I really enjoyed the 16th hole - a true gem. The views along the Fife coast to St. Andrews were marvellous, and set me up to come back and play this course again very soon I hope. A Five-ball rating! I played the Torrance Course on a fine August day in perfect conditions; the sun was shining and there was a swirling wind just to add to that St Andrews golf experience. The practice facilities shared by both Fairmont courses caters for every aspect of the game with a large putting green, short game area and full length range. At the first tee of the Torrance course I was greeted by the starter who provided a bit of information about the course and wished me a good round. After the pleasantaries were exchanged I was met by the 358 yard par 4 first hole which sweeps from right to left. The green cannot be seen from the tee so the golfer must drive towards a fairway-width wide gap in an old-looking stone wall to get a view at the green. The approach must then fly over a dry ditch and onto the long putting surface, making this a pretty good opener. The second is a straight par four, armed with a solitary fairway bunker and a strong wind in the golfer's face for protection, making it play longer than the 438 yards listed on the scorecard however the massive green offers a decent target which helps players to get to the green in regulation. Hole three, whilst a nice enough hole, seemed a tad out of place given the surroundings - mainly due to the large lake all the way up the right hand side of the hole - and therefore doesn't seem to be in keeping with the links-style setting. Despite this minor blip it is one of the hardest holes on the course with two solid strikes necessary to get within striking distance of the green and the burn which flows from the aforementioned lake cutting right infront of the kidney-shaped green must also be negotiated. At 278 yards the next hole should just be a drive and a flick with a wedge, although the hole is not easy as I found when I flew my drive right into the face of the one expertly placed fairway bunker. After escaping the sand the pitch shot was no formality due to the slope which runs off the back of the green as I unfortunately discovered after hitting my shot a shade too heavy. The first par 3 is guarded by one side bunker which shouldn't come into play so if the tee shot can be landed on the correct level of the green the golfer is in with a good shout at birdie. As the course starts to curve around the back of the hotel another par 5 is up, this time swinging from left to right. The fairway is undulating and it can be difficult to find an even lie from which to hit the second or third shot. The approach to the green definitely favours a fade due to the three strategically placed bunkers short right of the raised green. I liked the seventh, another par 4 that should be driveable for the big hitters and a 220-odd yard carry is necessary to fly the heavy rough. The safer route would be to play left to the middle of the fairway although three bunkers lie in wait to gather up any balls flirting in the vicinity. The fairway contains many mounds and humps which means any pitch or bump and run must be judged to perfection just to reach the green. Next up is a compact little par three from an slightly elevated tee to a generously large green - another good hole where accuracy is paramount to avoid falling into three-putt territory due to the sloping of the putting surface. The last hole on the outward nine is fairly straight and takes the golfer towards the clubhouse. The main hazard in the approach is a deep Road Hole-esque bunker directly infront of the green. The homeward nine opens with a left to right par 4 of 427 yards; the fairway is relatively narrow however the further left the tee shot the better the angle to the green, to which there is a slight descent from the fairway - another tough hole. Hole ten is a shortish par three but enough club must be taken to reach and then hold the green as the surface falls away, particularly to the front right. The 12th signals the start of a difficult run of three holes, the first being an all uphill 500 yard par 5. With the wind not providing any assistance and a dry ditch infront of the green this is a genuine three-shot par 5 in which the fairway winds from the right to the left the back to the right again before the swale, however the fairway is not all that wide - placing a premium on keeping it straight off the tee and with fairway woods yet again. A rippling fairway awaits on the next hole which runs parallel to the entrance road to the hotel and an extra club will probably be needed on the approach due to two hidden dips which lie on the path to the green. The 14th is another tricky par four defended by a ditch disecting the fairway 30 yards infront of the green. Hole 15 is a 312 yard par 4 taking the golfer away from the hotel and clubhouse for the last time and avoiding the four greenside bunkers is without doubt the main challenge on this hole, leaving the golfer only a small target to aim at with the second shot. Then comes the best two holes on the course in my opinion, and by quite a margin I may add, these are real standout holes. 16 is a lovely downhill par 4, the drive can trickle down the hill towards the green if it gets a decent kick whilst dunes frame the meandering fairway. The green itself is relatively flat and the sight of nothing in the background but the a small stone wall and the North Sea is quite simply fantastic. After holing out I couldn't resist a peek over the wall and what a view - a steep drop down on to the deserted beach then nothing but the water out into the horizon. Taking all of the scenery in I made my way to the 17th tee box to find another great hole. A 153 yard par 3 over a wee stone wall to a diagonal and heavily sloping green. Should the green not be hit in regulation then a delicate touch is the order of the day due to the large elevation change from one side of the putting surface to the other. The closing hole is another uphiller and at only 485 yards it sounds a lot easier than it is. The tee shot favours a draw before probably a lay up to get into a good position to attack the raised green which rests atop the hill in front of the stylish clubhouse. The Torrance surprised me. I wasn't expecting a true gem of a course, but it was very good. The greens ran true and fast, the redesign of some of the holes has certainly made a difference. The loop around the hotel was very impressive, especially the drivable par 4 7th. The back nine was equally impressive with the 17th being the standout hole. The par 3 17th was impressive with a green that rivaled the size and contours of the ones along the coast at Kingsbarns. All in all this course is well worth a visit, with the Kittocks shutting in two weeks for a face lift. Played the Torrance last week.Almost unplayable. Fairways and greens loaded with sans. open qualifying in 11 weeks? I found this a very disappointing course. I was very much looking forward to playing it after reading so many rave reviews. I have played it twice now, once in February and found a great layout in winter condition. I came back in July, and have to say that it was probably in better condition in mid Winter!Although there are a few good holes on the course (the 10th and 17th being my favourites), with excellent views out over St Andrews and the sea, there are also many monotonous holes. My big gripe though was that the yellow tees were so far in advance of the whites / blacks that the real challenge was taken out of some potantially great holes, notably the par 3s. The clubhouse was totally overpriced and both times I have played there, rounds have taken in excess of 5 hours (which admittedly may cloud my judgment! ).